Given that it's situated in a renovated firehouse, Gallery5 isn't much of an actual space. It's small, kind of boxy — and man, can it get hot in there. But this downtown favorite gets steamy for a very good reason. R-Town's most interesting, eclectic, weird, fun and (yes) smart arts events often occur right here. 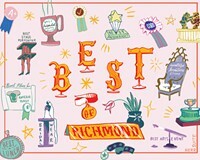 Proprietress Amanda Robinson also helps to bring the most vibrant indie-rock bands to town, and opens the doors to monthly affairs such as the Silent Music Revival, Voix de Ville Follies and performances by the Richmond Comedy Coalition. "We really appreciate everybody's love and support," Robinson says of the gallery's first-place showing, adding that "there's some cool stuff coming up." That includes a 24-hour Comic Book Day slated for September, which will see appearances by many distinguished cartoonists and comic creators. The other winners include Katie Ukrop's colorful Quirk, a perennial downtown favorite, and Crossroads Arts Center, the artist enclave on Staples Mill.